If you like style, performance and precise handling in your vehicle, then a midsize sedan is ideal for you. Read on to see the benefits of the 2019 Optima vs. all of these other sedans! 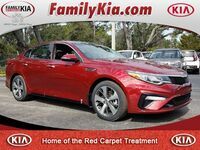 The 2019 Optima is fuel-efficient (up to 27 MPG city, 37 MPG highway), handles tight spaces well (35.8-foot turning circle), is less expensive than all to start (aside from the 2019 Sonata), and has a sportier/more exciting exterior than the others in this comparison, which have a more basic sedan look on the outside. Compare the Optima vs. each of these midsize sedans below! The Camry became a beast when it was redesigned for the 2018 model year, with upgrades in performance and fuel economy. But with those upgrades come a much higher price. While the 2019 Optima starts at $22,990 MSRP and goes as high as $31,990 for its top-line trim, the 2019 Camry starts at nearly $24,000 MSRP and its top trim runs $34,700. You get a lot more – more spacious interior, more speakers, nine consecutive IIHS Top Safety Picks – for the money with an Optima. The 2019 Kia Optima provides a larger and more comfortable interior than the 2019 Altima, with 104.8 cubic feet for passengers and up to 10 speakers with Harman/Kardon audio, while the 2019 Altima provides a smaller interior (up to 100.8 cubic feet for passengers), fewer speakers, and a less extensive history of IIHS Top Safety Picks (the Optima has nine straight and counting). The Optima also wins with a tighter turning radius at 35.8 feet vs. the Altima’s 37.4 feet. The Accord has a slight edge in top MPG and top HP, but the Optima is built like a sleek sports car compared to the Accord’s chunky exterior and inferior turning circle of 38.1 to 39.4 feet depending on the trim. The Optima also comes with superior audio in its base trim, with six speakers to the Accord’s four, and the Optima is more affordable than the Accord in its base and top-line trims, with a base MSRP nearly $1,000 less and a top-line trim that is exactly $3,000 less ($31,990) than the Accord’s ($34,990). The 2019 Kia Optima and 2019 Hyundai Sonata are close when it comes to price and performance, with the Sonata $600 more affordable in starting MSRP but with the Optima gaining an edge in top fuel economy with 27 MPG city, 37 MPG highway. The Optima also really shines with its design, which is more bold and aerodynamic than the Sonata’s stoic appearance, with design cues taken from the Kia Stinger sports car. Take a look at the picture above and see the difference. Bluetooth capability and Siri Eyes Free, both standard. Safety features like: Blind Spot Collision Warning, Lane Change Assist, Lane Departure Warning, Driver Attention Warning, and much more. Test Drive a Kia Optima Sedan at Family Kia! We have the Kia Optima on the lot at Family Kia, the Home of The Red Carpet Treatment! We are a local, family-owned dealership at 2665 U.S. Highway 1 South, St. Augustine FL, and we also serve Palm Coast, St. Augustine Beach, Nocatee, Hastings, Ponte Vedra Beach, St. Johns and Jacksonville, among other local cities. 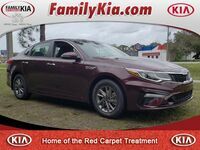 Please call us at (904) 808-0542 or visit us on the lot so we can set you up with a test drive of an Optima sedan or another Kia model on our lot, or check back here at www.familykia.com.